Fragment from The Architectural Uncanny: Essays in the Modern Unhomely by Anthony Vidler, 1992. Storefront’s Critical Halloween Party Bibliography is a compilation of readings that acts as a resource for individuals interested in investigating the topic of each year’s Critical Halloween event. 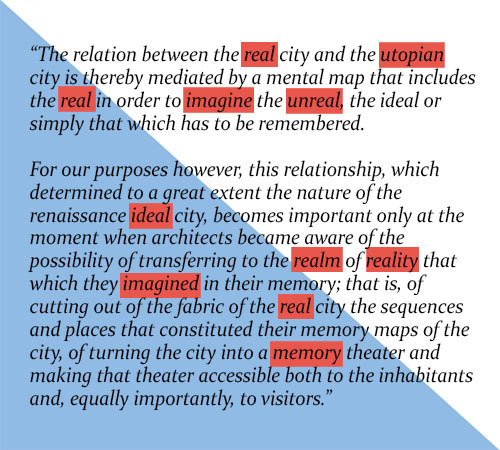 The bibliography for this year’s theme “REAL” focuses in particular on political embodiment, philosophical notions of reality, architectural and spatial imaginations, simulationism and computation, realism and surrealism in art, violence and architecture, and more. The REAL can carry connotations of politics, technology, ontology, and capital, as well as alternative or obscured history and thought. With this bibliography, we collect existing philosophies, ideologies, and knowledge in the archives of history through a series of texts that sheds light upon the articulation of thoughts, costumes, and critique. Atkinson, Niall; Lui, Ann; Zeiger, Mimi et al. Dimensions of Citizenship: Architecture and Belonging from the Body to the Cosmos. Los Angeles, CA: Inventory Press, 2018. Baudrillard, Jean. Simulacra and Simulation. Ann Arbor, MA: University of Michigan Press, 1994. Breton, André. Manifesto of Surrealism, 1924. Reprinted in Manifestoes of Surrealism. Trans. Seaver, Richard and Lane, Helen R., Ann Arbor, MI: The University of Michigan Press, 1969. Davis, Angela Y. If They Come in the Morning …Voices of Resistance. New York, NY: The Third Press, Joseph Okpaku Publishing, 1971. Debord, Guy. Society of the Spectacle. Kalamazoo, MA: Black & Red, 2000. Du Bois, W.E.B. Black Reconstruction in America: An Essay Toward a History of the Part Which Black Folk Played in the Attempt to Reconstruct Democracy in America, 1860–1880. New York, NY: Harcourt, Brave and Company, 1935. Du Bois, W.E.B. “The Comet,” Darkwater, 1920. Reprinted in Dark Matter: The Anthology of Science Fiction, Fantasy and Speculative Fiction by Black Writers, eds. Simmons, Martin and Thomas, Sheree, New York, NY: Aspect/Warner Books, 2000. Fraser, Nancy. Fortunes of Feminism: From State-Managed Capitalism to Neoliberal Crisis. London: Verso Books, 2013. Harvey, David. Rebel Cities: From the Right to the City to the Urban Revolution. London: Verso Books, 2012. Hoskyns, Catherine. Integrating Gender: Women, Law and Politics in the European Union. London: Verso Books, London, 1996. Jayawardena, Kumari. Feminism and Nationalism in the Third World in the 19th and Early 20th Centuries. The Hague, Netherlands: Institute of Social Studies, 1982. Kant, Immanuel. Critique of Practical Reason. trans. Thomas Kingsmill Abbott, New York, NY: Cosimo Inc., 2009. Kluge, Alexander and Negt, Oskar. Public Sphere and Experience: Analysis of the Bourgeois and Proletarian Public Sphere. London: Verso Books, 2016. Korsgaard, Christine M. Creating the Kingdom of Ends: Reciprocity and Responsibility in Personal Relation. Cambridge, UK: Cambridge University Press, 1996. Madden, David and Marcuse, Peter. In Defense of Housing: The Politics of Crisis. London: Verso Books, 2016. Marcuse, Herbert. One-Dimensional Man: Studies in the Ideology of Advanced Industrial Society. Boston, MA: Beacon Press, 1964. Monbiot, George. How Did We Get into This Mess? Politics, Equality, Nature. London: Verso Books, 2016. Mouffe, Chantal. “Every Form of Art Has a Political Dimension.” Interview by Rosalyn Deutsche, Branden W. Joseph and Thomas Keenan,” Grey Room 02 (Winter 2001): 98-125. Moyn, Samuel. Human Rights and the Uses of History. London: Verso Books, 2017. Nixon, Rob. Slow Violence and the Environmentalism of the Poor. Cambridge, MA: Harvard University Press, 2011. Reichardt, Jasia. Robots: Fact, Fiction, and Prediction. New York, NY: Thames & Hudson Ltd. 1978. Said, Edward. Orientalism. New York, NY: Pantheon Books,1978. Shraya, Vivek. I’m Afraid of Men. London: Penguin Books, 2018. Simon, Joshua. “Neo-Materialism: Part I: The Commodity and the Exhibition.” Journal #20, e-flux, November 2010 https://www.e-flux.com/journal/20/67643/neo-materialism-part-i-the-commodity-and-the-exhibition/. Solnit, Rebecca, Call Them by Their True Names : American Crises (and Essays). Chicago, Illinois: Haymarket Books, 2018. Tafuri, Manfredo. The Sphere and the Labyrinth: Avant-Gardes and Architecture from Piranesi to the 1970s. Trans. Pelligrino d’Acierno and Robert Connolly, Cambridge, MA: MIT Press, 1990. Therborn, Göran. Cities of Power: The Urban, The National, The Popular, The Global. London: Verso Books, 2017. Tuck, Eve and Yang, K. Wayne. “Decolonization is not a metaphor,” Decolonization: Indigeneity, Education, & Society 1, 1, 2012. Vaid-Menon, Alok. Femme in Public. New York, NY: 8 Ball Community, 2017. Vidler, Anthony The Architectural Uncanny: Essays in the Modern Unhomely. Cambridge, MA: MIT Press, 1992. Wark, McKenzie. Molecular Red: Theory for the Anthropocene. London: Verso Books, 2016. Weizman, Eyal. Forensic Architecture: Violence at the Threshold of Detectability. Cambridge, MA: MIT Press, 2017.